The upcoming Ford Freestyle is the first crossover from Ford India and the model will be positioned between the Figo hatchback and the EcoSport SUV. A couple of production units of the Ford Freestyle crossover were recently spotted ahead of its official launch. Expected to go on sale in India in April, Ford's new crossover, or as the company likes to call it, the compact utility vehicle (CUV), will be positioned between the Figo hatchback and the EcoSport subcompact SUV. Based on some of the earlier images we shared, we know that the Ford Freestyle has already started reaching dealerships and the launch is imminent. 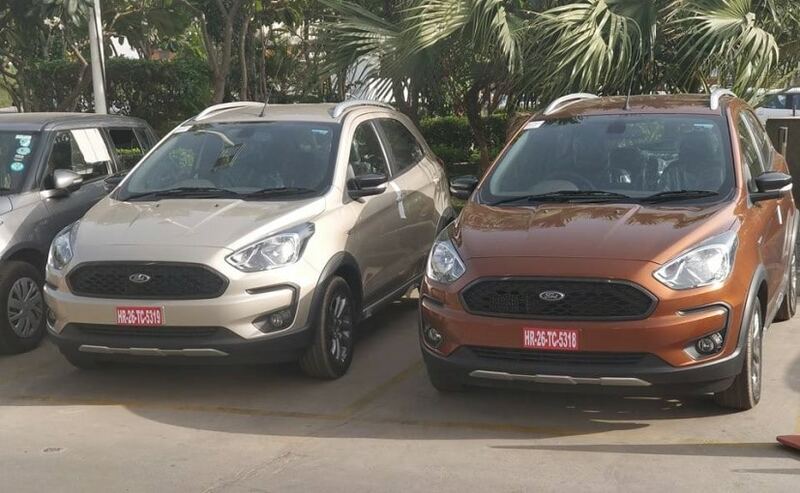 This time around, we also get to see a new champagne gold colour option for the Ford Freestyle, alongside the already seen copper brown option. Although the company hasn't announced a date yet, we expect the new Ford Freestyle to be launched towards the second half of April 2018, while bookings are expected to start a bit earlier. In fact, Ford has already added the Freestyle to it official website along with some engine and features details. Visually, the Ford Freestyle comes with a rugged styling with a host of black design elements for the grille, bumper inserts, underbody cladding and ORVMs among others. The Freestyle also gets larger sweptback headlamps, silver skid plate, subtle character lines on the bonnet and profile, side-body cladding and roof rails. The car runs on a set of smart twin-five-spoke alloy wheels and also gets LED taillamps. The Freestyle will also come with the company's new signature floating style touchscreen infotainment system with smartphone integration, offering Apple CarPlay and Android Auto along with the company's SYNC3 connectivity feature. Powering the new Ford Freestyle will be an all-new 1.2-litre Dragon series petrol engine that makes 94 bhp, in addition to the tried and tested 1.5-litre three-cylinder diesel engine making 99 bhp. Both the engines are three-cylinder units and will come mated to a 5-speed manual gearbox as standard.